These limitations don't matter at night, because the F-117's stealthy shape enables the aircraft to avoid detection by enemy radar. But in the light of day, the enemy can see the black plane against the sky, and can take aim without the help of radar. F-117 pilotos train almost exculsively for night missions, and the darker it gets, the happier they are. But this is a compromise at best. In the summer, when there are only a few hours of darkness, a figheter like the F-117 can fly only one sortie per day. And the darkness that hides the F-117 also hides its targets. under investigation could not only make future fighters disappear from radar screens but could also make them almost completely invisible to the human eye. By the early 2000s, stealth may be practical in broad daylight. Today's experiments exploit a principle that was demonstrated half a century ago, in a secret project code-named Yehudi. In that project, engineers mounted lights on an anti-submarine aircraft make it harder to spot against a bright sky. range of enemy radar. Reducing the radar reflectivity so radically meant that the designers of Have Blue also had to reduce its visual and infrared signatures, according to a rule of thumb known as "balanced observables." This rule says that a stealth aircraft should be designed so that every dectection system arrayed against it has roughly the same range. There is no point in building an airplane that is invisible to radar at five miles if optical sensors can see it at 10 miles. Lamps mounted on the bomber made it less visible to enemies. Lamps and a blue and white paint scheme campoflaged the F-4. TODAY'S EXPERIMENTS with visual stealth have their roots in a 1943 U.S. Navy project code-named Yehudi. The intent of the program, which was highly secret at the time and came to light only in the1980s, was to give Navy patrol aircraft a better chance of sinking enemy submarines. During 1942, German U-boats took a heavy toll on merchant marine shipping off the East Coast of the United States. Aircraft scrambled to attack the U-boats, but submarine captains called for crash dives whenever they spotted approaching planes. By the time an aircraft got close enough to fire upon a sub, it had disappeared beneath the surface of the ocean. Yehudi's inventors needed a way to make the antisubmarine aircraft harder to see, and they realized that camouflage paint wouldn't do the job: Regardless of its color, the airplane would stand out as a black dot against the sky. The only way to make the plane less visible was to light it up like a Christmas tree. The engineers fitted a portly TBM-3D Avenger torpedo-bomber with 10 sealed-beam lights installed along the wing's leading edges and the rim of the engine cowling. When the intensity of the lights was adjusted to match the sky, the Avenger blended into the background. Tests proved that the Yehudi system lowered the visual acquisition range from 12 miles to two miles, allowing the Avenger to get within striking distance of its targets before they submerged. 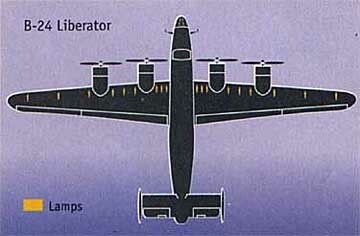 A B-24 Liberator bomber was also modified, with similar results. Yehudi was not put into production, because better radar had already enabled Navy airplanes to regain the tactical advantage, but the idea was revived after air battles over Vietnam. 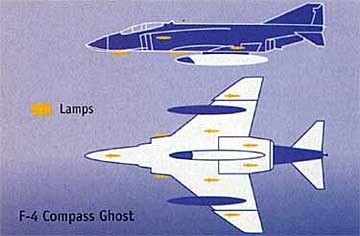 Concerned that the big F-4 Phantom could be seen at a greater range than its much smaller Russian adversary, the MiG-21, the Pentagon started a program called Compass Ghost. An F-4 was modified with a blue-and-white color scheme and nine high-intensity lamps on the wings and body. reducing the detection range by as much as 30 percent. Click here to go to the Feature Articles archives.